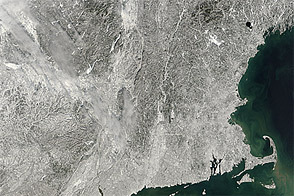 In February 2013, a nor’easter pounded the eastern United States, doing particular damage along the coast of New England. 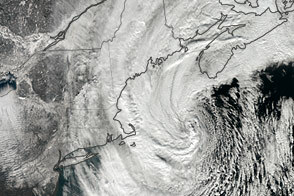 Wind gusts reached hurricane-force in several coastal states, raising a four to five-foot (1 to 1.5 meter) storm surge on top of astronomically high tides. 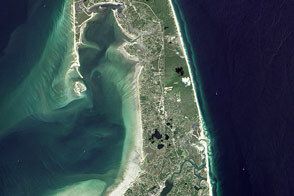 The result was extreme beach erosion along the coast of Massachusetts and other coastal areas. 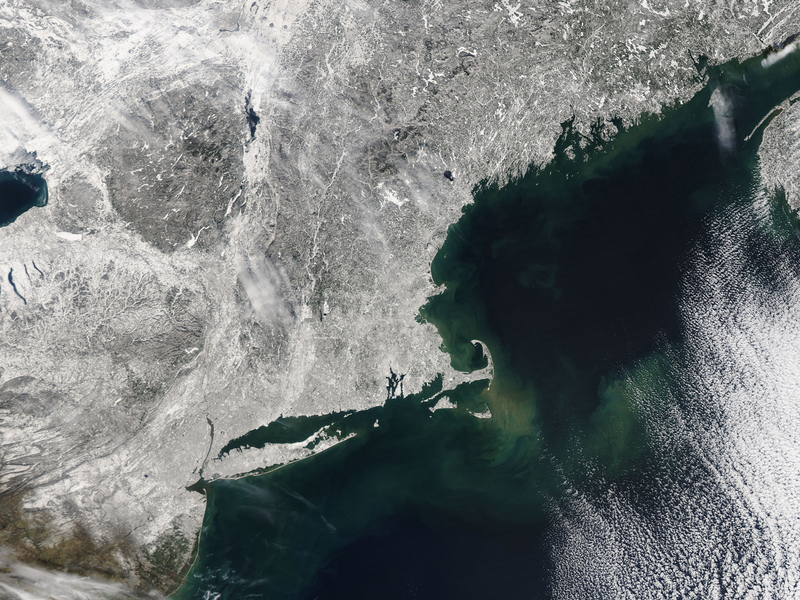 In February, plumes of tan and milky sediment swirl in the waters off of Cape Cod and the east coast of Massachusetts. According to Graham Giese, a marine geologist at the Provincetown Center for Coastal Studies, the suspended sediment was most likely comprised of silts and clays stirred up from the shallow seafloor. 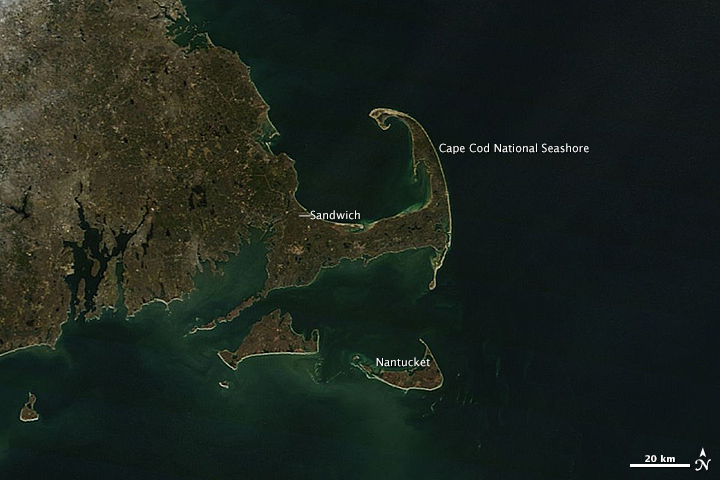 Cape Cod, Martha’s Vineyard, and Nantucket—as well as the shelves and shoals around them—were laid down as glacial deposits when large ice sheets retreated at the end of the last Ice Age. 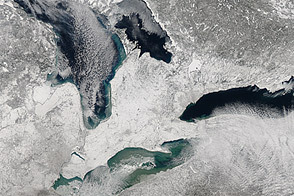 It is also possible (but less likely) that some of the discolored water is phytoplankton blooming in the wake of the storm. 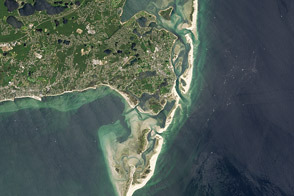 According to news reports, many beaches on the Cape and the South Shore of Massachusetts—particularly north- and east-facing towns like Sandwich—lost 15 to 20 feet (4 to 6 meters) of beach to erosion by the sea. 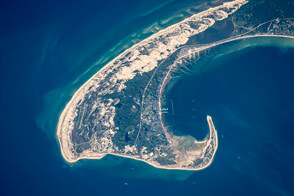 Along the Cape Cod National Seashore, steep bluffs of sand and glacial deposits (some standing as high as 140 feet or 40 meters) were undermined by storm surges in many places. Many of the same beaches were battered in October by Hurricane Sandy and did not have much protection from the February storm. Public officials claimed that many beaches have lost more sand in the past year than in the previous ten. 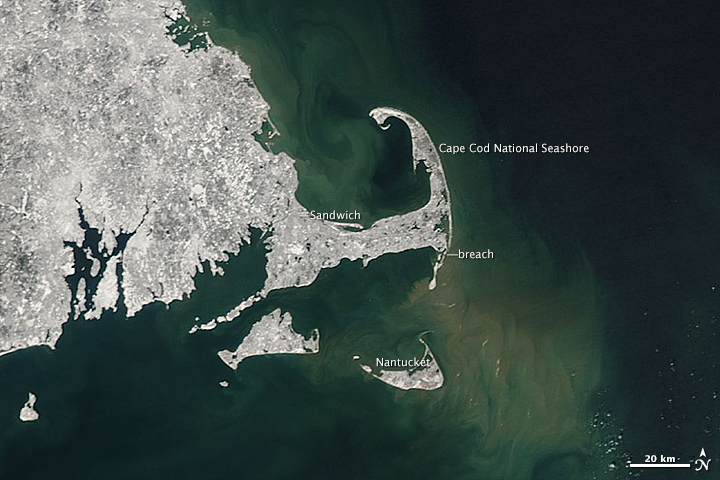 Though coastal features are usually too small to spot in MODIS imagery, the February 10 image shows a new breach in the barrier known as South Beach, off the elbow of Cape Cod in the town of Chatham. “It is quite remarkable that your imager caught this breach so close to its initiation,” Giese noted. 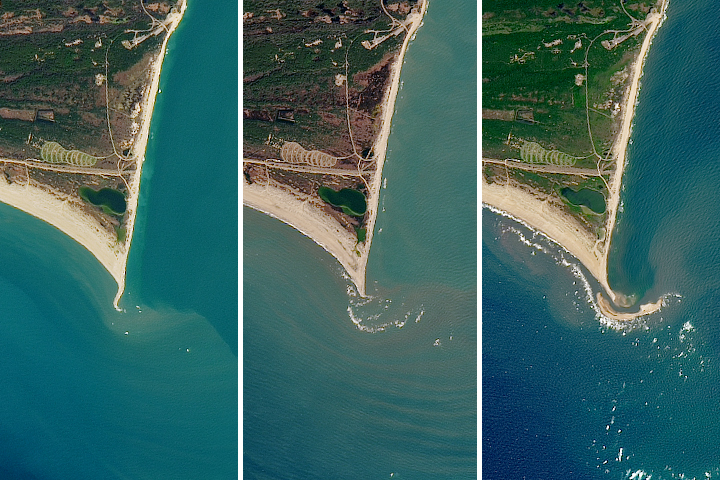 To view an aerial photo and ground-based video of the storm-changed coastline, visit our Earth Matters blog. 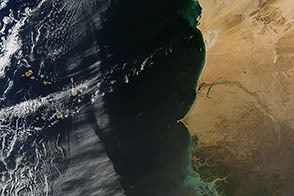 NASA image by Jesse Allen, using data provided by LANCE/EOSDIS Rapid Response. Caption by Michael Carlowicz. 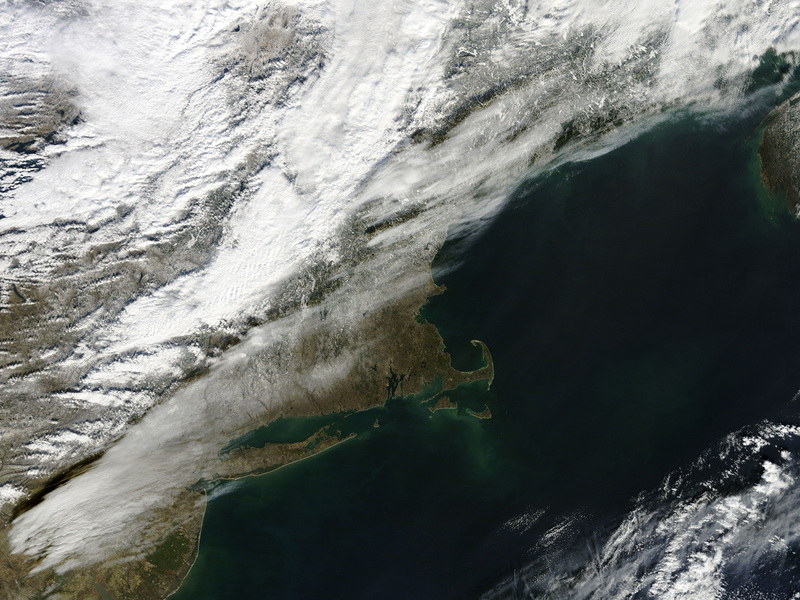 Winds and waves from a February 2013 nor'easter churned up the seafloor and beaches around coastal Massachusetts. 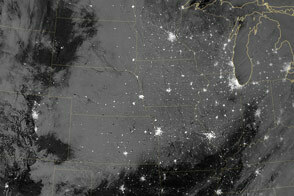 A record-setting blizzard struck the northeastern United States in early February 2013. 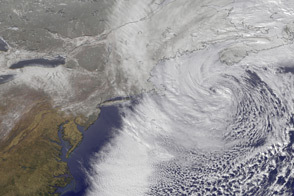 The Boston Globe (2013, February 13) Blizzard blasts away parts of beaches, dunes, cliffs. Accessed February 26, 2013. Cape Cod Times (2013, February 17) Decimated Dunes: Blizzard pounded Sandwich's barrier beach. Accessed February 26, 2013. Cape Cod Times (2013, February 14) New breach in Chatham barrier beach. Accessed February 26, 2013. Oldale, R.N. 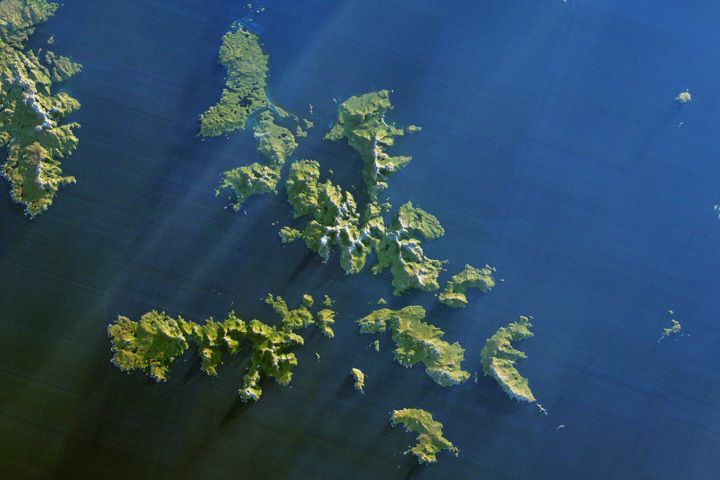 (1992) Geologic History of Cape Cod, Massachusetts. Accessed February 26, 2013.